Reddcoin has dropped by over 35% during the past 24h of trading, now worth 14 satoshi ($0.000082) on Cryptsy. Since hitting a peak of 34 satoshi on July 27, the coin has lost 59%. The coin had undergone relatively flat trade during the first half of 2014, but then surged by 750% within 2 months. Reddcoin now ranks 22nd in market cap, 13th amongst mineable currencies, worth $2.4 million. 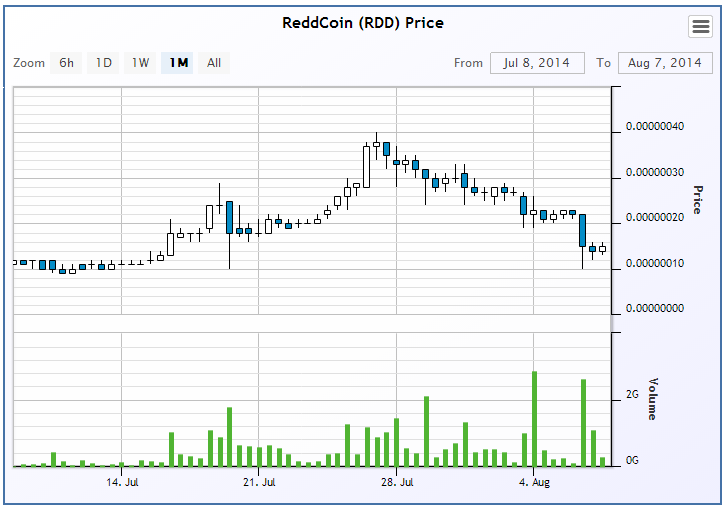 Reddcoin remains one of the most heavily traded altcoins, with 590 BTC ($350,000) worth traded during the past 24h. Over 90% of this volume take place on Cryptsy. However, its USD-based trading on Cryptsy continues to languish, with only 2.35 BTC ($1370) traded in the same period. According to its website, Reddcoin is “social currency that enriches people’s social lives and makes digital currency easy for the general public.” It integrates a digital currency platform with major social media networks. Community members are hoping that its introduction to multi-pool mining will provide upward pressure on the price. Expect a short-term bounce, but if the multi-pool fails to inspire buyers, there is little basis for mid-term support above 8 satoshi. Seriously, this is a bad article. You obviously have no idea what going on with Reddcoin. Go to reddit.com/r/reddcoin and learn before posting crap.